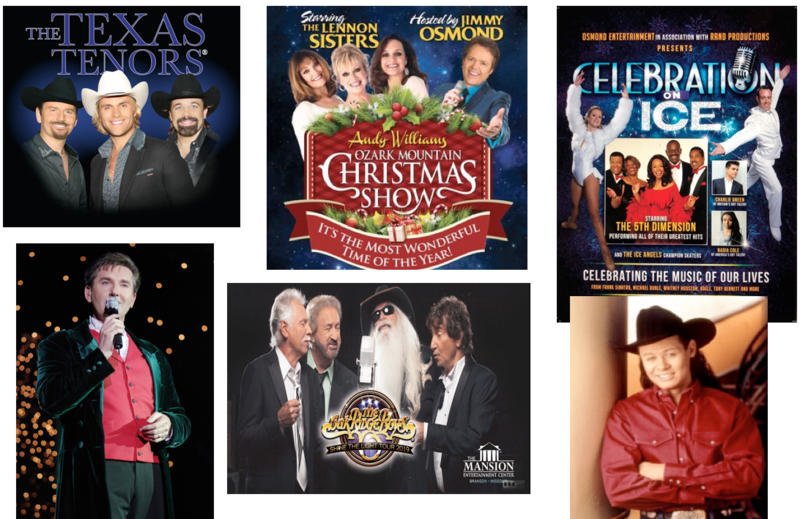 Danny O' Donnell; Oak Ridge Boys; Neal McCoy, Texas Tenors, The 5th Dimension with the "Celebration on Ice"
Deposits and Final Payment Due Date: $125 per person deposit is due with each reservation and is non-refundable after September 1, 2019 Final balance due: October 5, 2019. Cancellations: Money returned with cancellations between September 1-October 5, 2019 are contingent upon what Happy Trails Tours can retrieve back from hotels, charters, theaters, restaurants, etc. No refunds with cancellations made after October 5, 2019. Reservations are transferable. Final Documents: Final documents are expected to arrive in late October with specifics on boarding location and hour. How to Pack: The tour is completely casual. Dress comfortably with good walking shoes. Pack along a fall/winter jacket. Pack a camera and/or video camera. Still shots are allowed in the theaters…but videos of any kind are not. Seat Rotation: We do not rotate seats.. We used to try to preset seating but its getting more and more difficult to promise any particular seat. Please let us know in advance if you have any special needs and we'll do our best to accommodate ~ But cannot promise. Hotels /Smoking/ Non-smoking: The hotels where we are staying are very nice. Read your day-by-days to learn the specifics on each property. All the rooms are non-smoking. Most hotel properties are all non-smoking. Please don’t smoke in them. Penalty charges WILL apply. We stop every 2 ½ -3 hours for quick breaks, comfort stops or meals along the way. Theaters/ Name Tags: We’ll bring you to the front door of all the theaters where you’ll be greeted by a hostess. They’ll bring us in (and yes…you’ll walk right past all the long lines at the ticket booth) and direct us to our seats. The seats are reserved but we will not be given individual ticket stubs. Your “name tag” will be your ticket stub. Wear it faithfully. You’ll receive the name badges after you get on the bus. Weather: The weather should be warm and very nice, however, we‘ve seen it SNOW in Branson this time of year (Though that‘s rare…we’ve also seen it get as hot as 80 degrees!) Normal temps are between 55-65. With the high elevation, we recommend layering your clothing since mornings and evening can be cool and afternoons can be warmer. Weather Conditions: In 2007 when we were on a Branson Christmas tour, a blizzard swept through the Midwest and paralyzed the entire region from Kansas City to Northern Minnesota. It caused us to have to spend one more night in Branson (where it was 65 degrees and sunny!). The following day, we traveled home with only wet roads to contend with and everyone stayed safe. We tell you about this because it can happen again. (Hopefully it won’t). One more piece of information….You are financially responsible for the added expense if this should happen. Actually, we had a wonderful “extra” day in Branson and everyone was happy. We took in another show, ate at another nice restaurant but most of all…we were safe and warm. NOTE: Travel Insurance helped pick up the cost of this added expense for our travelers who purchased the insurance. At the time this tour is being planned, many shows in Branson have not confirmed specifics on time and place of performance. Watch for revisions. This tour includes boarding in towns throughout the state of MN with our bus charter company, Trobecs of St Stephens, MN. As we get close to our departure date, we'll confirm specifics on time and place of boarding. At this time, please use this schedule as a guide to give you an idea of what we've done in past years. 8:00-9:00- Arrive to Duluth Perkins Miller Hill Mall Restaurant for breakfast, paying on own. _____8:45 am- Duluth Perkins Miller Hill Mall The coach departs at 9 am from Duluth. Central Minnesota: Trobec Bus driver will provide shuttle transportation either by car, van or coach depending on the number of passengers. This is a preliminary boarding schedule and time ~ specifics will be announced about one month prior to the 2019 tour departure. Our friends from Central MN will meet the Happy Trails group in Burnsville. 1:15 pm- Re-board the coach and continue on to Des Moines, Iowa. 2:45 pm- A mid-afternoon coffee and comfort stop will be made at the MN / IA boarder at the "Top of Iowa"
We'll stay here about 1/2 hour and then we'll continue on our way. 6:30 am- Enjoy an included full breakfast at the hotel before we depart for Branson. 7:30 am- The coach departs Des Moines for Branson, MO. A mid-morning stop will made as well as a lunch stop en-route. We’ll settle into this wonderful property. The Holiday Inn offers rooms with all inside corridors. These rooms also have 2 queen beds (kings for couples unless otherwise specified) & pillow top mattresses, coffeemakers, irons & ironing boards and hairdryers. (Very nice property). They also serve a nice breakfast each morning in their breakfast room. 6:00 pm- A nice dinner is included tonight at the Grand Country Buffet, included. Here you'll have hundreds of delicious items to choose from. 7:00 pm- Begin our way by motor coach to the beautiful Moon River Theater. 8:00 pm- Settle into your seats on the main floor to see Texas Tenors. 7:00 - 8:45 am Enjoy breakfast served at the hotel. 9:00 am- Board the coach and we'll make our way through the Ozark Mountains with our good friend and tour guide, Omar Gibson. Our tour will include a stop Point Royal overlook, Lake Taney Como and a drive over the dam along with stories and the history of beautiful Ozark Mountains. We'll also make time for a drive through the College of the Ozarks making time to pick up one of their delicious home- made Fruitcakes. 11:30 am- Arrive to Silver Dollar City. Silver Dollar City announces an EVEN BIGGER & BRIGHTER CHRISTMAS, debuting an all-new, 8-story, state-of-the-art Christmas Tree — the centerpiece to the new JOY ON TOWN SQUARE. The custom-designed, towering tree will soar 80 feet! Add to this the singing, the little shops, musical theaters and places to get a bite to eat are all there at Silver Dollar City. You will be here for a few hours - giving everyone plenty of time to explore as per your own interests. 3:15 pm- Re-board the coach. 4:00 pm- Arrive to the Shepherd of the Hills "Christmas Village" and take our seats for a "Shepherd's Christmas Carol" Dinner Show. We've been invited to enjoy a full -course turkey dinner with pumpkin dessert while presented with their version of a true Christmas classic. Laugh along the way as your favorite characters from the Shepherd of the Hills try to remind an incorrigible Ollie Stewart of the magic of Christmas and the true meaning of friendship. If you have not read Harold Bell Wright's, Shepherd of the Hills book, we highly encourage you to do so! 6:30 pm- Stroll through the Christmas Village's "North Pole Adventure" where you'll see a glow of dazzling lights, unique artisan crafts and more. Here you can even enjoy admission into Inspiration Tower that offers a spectacular view of the city lit up at night! 7:30 pm- Board their trams and take a short ride through the Trail of Lights where we'll top the night off with a holiday evening ride. 7:00 -9:00 am- Breakfast is served at the Inn. Help yourselves. 9:20 am- Board the coach and we'll travel to the Moon River Theater for a morning show. 10:00 am- Settle into your seats as we enjoy the wonderful sounds of the 60's from the "5th Dimension" and their "Celebration on Ice"
2:30 pm- We'll wind our way to our next theater to see another amazing performer at the Mansion Theater. 3:00 pm- Settle in for Neal McCoy's Show - He'll do some of the favorites and of course some wonderful Christmas songs, too. 5:45 pm- Dinner will be included tonight at McFarlain's Restaurant - Here you'll get several plated options to select from at the time of seating. 7:00 pm- Re-board the coach and travel back to the Mansion Theater for the 8 pm performance of the Oak Ridge Boys! Take our seats and settle in for a fabulous evening of great music! One of the most enduring and popular country groups of all time, the Oak Ridge Boys celebrate more than 50 years of performing together in a show that is sure to be the highlight of your trip! For more than 50 years, the Oak Ridge Boys have producing some of the most popular and distinctive-sounding music to be heard anywhere – now you can see them LIVE on stage at the Mansion Theater in Branson, Missouri! Still made up of the band’s original members (William Lee Golden, Duane Allen, Joe Bonsall, & Richard Sterben), they deliver some of their biggest hits and chart-topping singles in a performance that you won’t want to miss! Performing alongside each other since the 70s, the current lineup shows what passion and dedication the group has for performing. Sit back and enjoy a combination of their greatest hits and some holiday favorites as well! 12:30 pm - The coach depart the hotel - make a stop at Branson Landing for those who are downtown shopping and we'll continue our way to our next theater... The Welk Theater. 2:00 pm- Curtain Call for Danny O Donnell's Show. Danny put on an amazing show last year and has plans to entertain his fans like never before! He's excited to be back on the road and this year he plans on a full traditional Christmas Show. If we have a spare bit of time between leaving Danny's show and dinner. Stay tuned as we fill this with a fun stop along our way. Dinner included ~ to follow at the Stage door Cantina ~This is a buffet dinner located in the Welk Theater where Danny's show is. 8:00 pm- Take your seats for the "Ozark Mountain Christmas Show" Hosted by Jimmy Osmond and starring the Lennon Sisters! For the 27th season, the legacy continues, starring The Lennon Sisters, and hosted by Jimmy Osmond. Great variety, singers, dancers, prancing reindeer, the Moon River Orchestra, and maybe even old St. Nick himself…all performing your favorite holiday songs. Also featuring The Lennon Granddaughters and Britain’s Got Talent singing sensation Charlie Green are all part of the show. Many of you may not know this, but Jimmy Osmond purchased the Moon River Theater from Andy Williams as a promise to Andy to keep his legacy alive. And he's doing just that! Come enjoy all the variety that made Andy’s Christmas shows so spectacular! 7:30 am- 8:30 am - Enjoy breakfast. 8:30 am- We'll say good-bye to Branson, MO.